Welcome to Graceful Acres Farm! Our farm is located just outside the charming town of Pittsboro, NC and not far from the Chapel Hill, Raleigh and Durham area. We are easily reached from Hwy 64 or Hwy 87. Our breeding goal is to improve the fiber quality as well as the phenotype of the Suri Alpaca, based on Accoyo genetics. We have a small foundation herd of 5 alpacas, and have 3 cria on the way next spring. 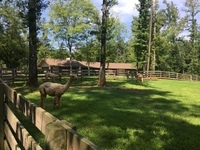 We will be welcoming visitors to our farm this summer and would love to show you our alpacas! 1. All of our bred females are ultrasound-confirmed pregnant. 2. Open females come with a free breeding with one of our herdsires of the buyer's choice. Financing options are available. Please ask us about our financing options once you have selected your alpacas.